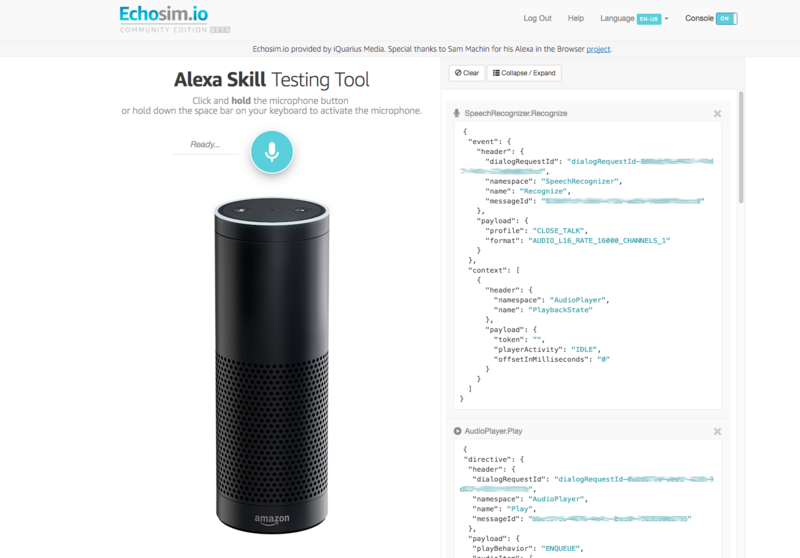 Since Echosim.io launched last year, the community-built web-based tool has enabled developers around the world to connect to Alexa to test their custom skills without hardware. To celebrate its first anniversary, Echosim.io is releasing a new developer console in Echosim.io to make skill testing even easier. The console exposes the incoming and outgoing JSON messages between Echosim.io and the Alexa Voice Service (AVS). In this console, you can get an overview of AVS’s background processes and spot issues in your skill’s responses in real-time. It’s easier than ever to monitor playback of audio streams returned with the Play directive and tweak playBehavior or troubleshoot metadata issues. Now you can easily track the directives or events that may be causing problems. You can ask specific questions in the developer forums and pinpoint relevant information in the official documentation. You can also report problems with references to identified events, directives by name, namespaces, exact parameter information such as tokens, messageId, and metadata objects. Watch a skill in action and pick up some ideas for your own project. You can toggle Echosim.io’s console on and off on the upper-right corner of your screen. See a verbose response in action by asking Alexa which movies are playing nearby. The Alexa Skills Kit (ASK) enables developers to build capabilities, called skills, for Alexa. ASK is a collection of self-service APIs, documentation, templates, and code samples that make it fast and easy for anyone to add skills to Alexa. Developers have built more than 10,000 skills with ASK. Explore the stories behind some of these innovations, then start building your own skill. Once you publish your skill, mark the occasion with a free, limited-edition Alexa dev shirt. Quantities are limited.